Diateino, the French publisher of Guy Kawasaki’s The Art of the Start and Reality Check as well as and Seth Godin’s Tribes, will release the French translation of Seth Godin’s Linchpin on May 2o. This time, I was not the translator, but I wrote a preface that is available on the Diateino blog. Here below is the English translation of my text. 1) Mass marketing that harps prosaic messages for insignificant products offered to ordinary people, and for which schools train legions of average students whose personal goal is to do what they are told to do and then get back home, put on their slippers and watch TV. 2) Inspired marketing that addresses early adopters, plugged-in folks, geeks, and enthusiasts, and that tells stories about products or people you feel like discovering and events in which you want to participate. This book is for people who want to be more than “faceless cog[s] in the machinery of capitalism” (the “factory”), as well as executives who understand that they need more than “two teams” (”management and labor”) to make an impact on people’s lives, those who intend to create “a third team, composed of “linchpins.” That is, a group of people who, through their leadership and their drive, “can invent, connect, create and make things happen.” “Linchpins are the essential blocks of tomorrow’s high-value organizations. They don’t bring capital or expensive machinery, nor do they blindly follow instructions and merely contribute labor. Linchpins are indispensable, the driving force of our future.” As was the case of Tribes, this book sits in between several genres: it’s a socio-political pamphlet, a manifesto for individual and interpersonal development, and a call for a new workplace. The book starts with a reference to Adam Smith’s The Wealth of Nations that focuses on the division of labor. Yes, “what factory owners want is an available set of compliant, low-paid, replaceable cogs to run their efficient machines.” But “great bosses and world-class organizations hire motivated people, set high expectations, and give their people room to become remarkable.” So unlock the genius in you. Interact with people, because you can’t be a linchpin alone in your corner. Inspire. Be pragmatic with artistry, and invent new rules that will make you succeed, and with you, the colleagues and the companies that leverage your talent. Seth Godin‘s contagious optimism and fervent iconoclasm remind me of one of the most fascinating assailant of the concept of factory, the Russian Prince Pyotr Kropotkin (1842-1921), who similarly invited his contemporaries to read again The Wealth of Nations‘ first chapter, in his Fields, Factories and Workshops. Their ultimate goal is quite similar: revive the artist in you, or something of “the artist who formerly found aesthetic enjoyment in the work of his hands,” but was replaced by a “human slave of an iron slave.” Both advocate novel “integral education” to help reshape a different future. This future varies based on any thinker’s present. In our time, the future will be designed by the change agents that Seth Godin calls the “linchpins,” because they will build a world where “dignity, humanity, and generosity” intersect. This book is not a theorist’s work. It’s the book of a man who calls for action without cluttering your brain with literary references. Don’t get it wrong, though! This is also the book of an extraordinarily cultivated author, who has obviously read and analyzed with a modern perspective the masterpieces he mentions in his remarkable bibliography. About Dominique Gibert, the CEO of Diateino in December 2009. 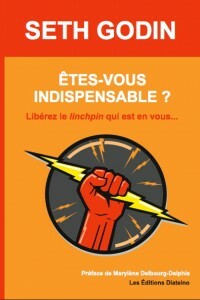 About Seth Godin: For an Insurrection of Talents: Seth Godin’s New Book, Linchpin: Are You Indispensable? – Tribes are more than a trendy phenomenon. French version on the Diateino blog. – Urban tribes and digital tribes, two simultaneous phenomena. French version on the Diateino blog. – The Convergence of Tribes: The Obama Campaign. French version on the Diateino blog.